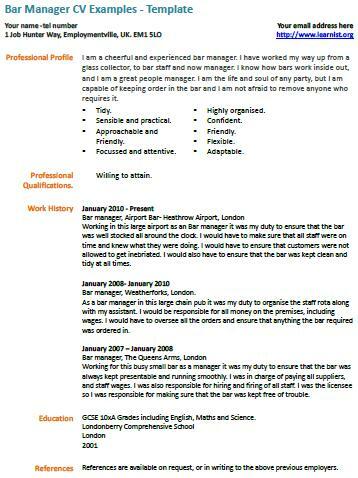 Bar Manager CV Example – Template. Amend as suitable and write your own CV in seconds then you can apply for Bar Manager job vacancies. Do not just copy paste this example to your CV since your one must be unique to yourself. If you want to become a Bar Manager then you can start searching for latest job vacancies on the job sites online including cv-library.co.uk, learnist.org and all others. If you are required to write a covering letter as well then view our latest cover letter examples! You can also visit our job seekers forums to ask your career related questions. I am a cheerful and experienced bar manager. I have worked my way up from a glass collector, to bar staff and now manager. I know how bars work inside out, and I am a great people manager. I am the life and soul of any party, but I am capable of keeping order in the bar and I am not afraid to remove anyone who requires it. Working in this large airport as an Bar manager it was my duty to ensure that the bar was well stocked all around the clock. I would have to make sure that all staff were on time and knew what they were doing. I would have to ensure that customers were not allowed to get inebriated. I would also have to ensure that the bar was kept clean and tidy at all times. As a bar manager in this large chain pub it was my duty to organise the staff rota along with my assistant. I would be responsible for all money on the premises, including wages. I would have to oversee all the orders and ensure that anything the bar required was ordered in. Working for this busy small bar as a manager it was my duty to ensure that the bar was always kept presentable and running smoothly. I was in charge of paying all suppliers, and staff wages. I was also responsible for hiring and firing of all staff. I was the licensee so I was responsible for making sure that the bar was kept free of trouble.